Friday February 22nd 1884 I was busy about the work most of the day. Hatt was over with both the children. It was so horribly windy that she left Edith all night and she kept me busy waiting on her all the evening. The young folks all went to the club dance. Saturday February 23rd 1884 I helped do up the work and Lee and I took Edith home. We came right back with things for dinner. I went over to have work done on my teeth in the afternoon. Mollie came back with me. I was busy most all the evening doing up the work. Sunday February 24th 1884 I was busy about the work all the forenoon and in the afternoon wrote a letter to Will and baked a fruit cake. I spent part of the evening at Niphers. 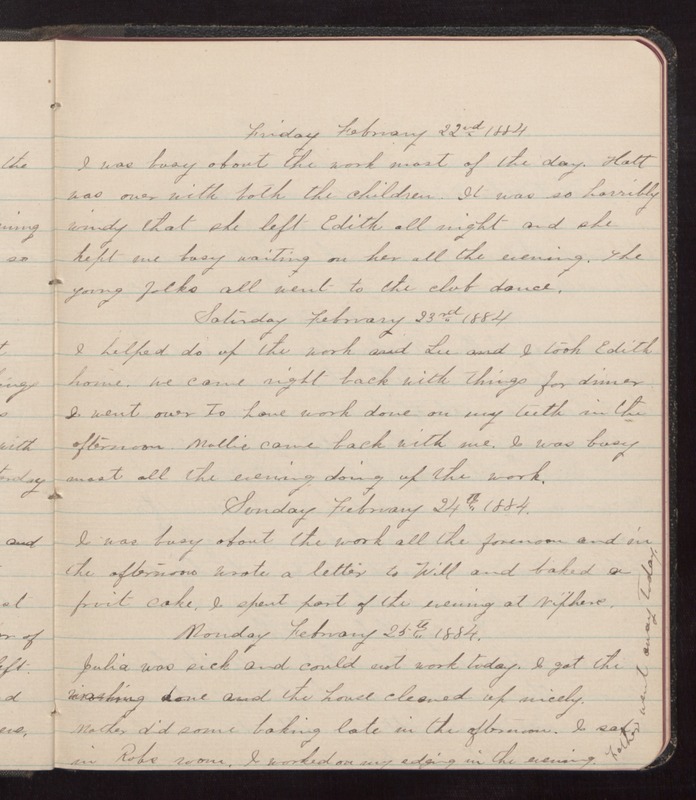 Monday February 25th 1884 Julia was sick and could not work today. I got the washing done and the house cleaned up nicely. Mother did some baking late in the afternoon. I sat in Robs room. I worked on my edging in the evening. Father went away today.